OK, I know that this is not a typical use case, however I wanted to give my Hyper V server a speed boost as well as lowering the noise level. The server has been running for months now and had 2 WD Raptors in a RAID 0 configuration using the onboard motherboard controller. It worked perfectly however I was after a bit more performance on the VMs and wanted to quiet things down as the Raptors in a rack mounted case can be a tad loud. My thought was to use some Samsung SSD in a RAID 0 as I had two Samsung 840 Pro drives that I was experimenting with earlier. As luck would have it, Newegg had a sale them for $114 and when the email came across I could not resist picking up a couple more of them as two was not going to provide me with enough storage space to allow for expansion. Four of them together was an entirely different story. What I ended up doing was stacking 4 Samsung 840 Pro 128 Gig drives, plus one Intel SSD for the OS. My case has two 3 drive cages so I was able to stack all 5 SSDs in one drive cage. In the picture you will see the Intel drive at the bottom and the 4 Samsung drives are on the top two positions. To power the RAID, I moved away from using the motherboard controller and opted to use my favorite RAID card, the Highpoint 2720. I have used the onboard controller for two drive setups (mostly mirrors) but with 4 drives I did not want to take any chances and wanted to get the maximum performance I could, not to mention maximum stability. 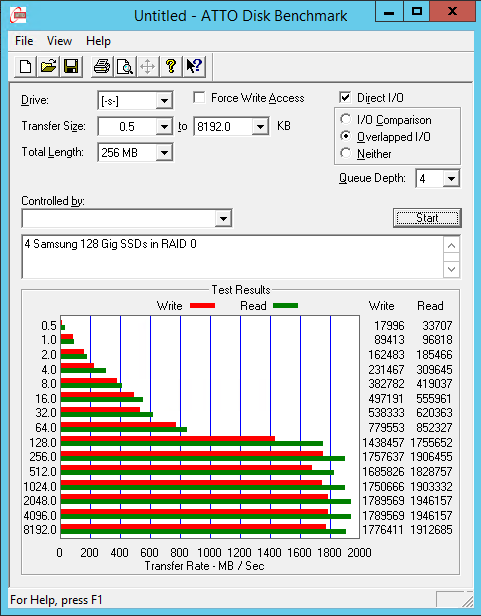 I configured the Highpoint 2720 card to stripe the 4 128 gig Samsung SSD drives and created a 512 Gig array (the total capacity of all 4 drives with no redundancy). Creating the array took less than 10 seconds and I was able to bring the array online, initialize it, and format in just a couple of minutes. Within 5 minutes my array was ready to take data and of course do some benchmarking. I know that many of you (as I did) are asking why put anything on a RAID 0 for fear of loosing data. The truth is that anytime you run a RAID 0 configuration, you are running the risk of loosing the data you put on it. You should only go this way under certain circumstances and of course be aware of the risks. That said, as a VM drive with the proper backup, the rewards may be worth the risks as recovering a VM tends to be a little easier. The risks are real and if your loose any one drive, the entire array will be lost. Since this contains only VMs, I have a backup of all the VHDH files as well as full backups of the VMs so recovering from a crash under this situation would be very quick. I would never run this configuration for actual data storage. For that task, I only trust RAID 5/6. Now this is the stuff dreams are made of. Needless to say I am amazed, and very impressed with the performance of this drive array. It is the fastest thing I have seen yet and given that only VMs reside on this, the speed is distributed amongst the virtual machines giving each a huge boost in performance. Speed of the virtual machines surpasses that of most dedicated systems in terms of boot, application launch, and overall response all without any noise. Had I not had two of the drives, the Highpoint card, and if the Samsung drives did not happen to go on sale, I might not have done this as the cost to do this from scratch is a bit high. Considering I had much of the hardware buying the 2 extra drives for $114 each to get this level of performance was more that worth it and I am very glad I did it. The only regret I have is I wish I had four more to load up the card….